DEFINING & HARDENING AGENT BLEND (Proprietary): Potassium Glycerol Gluconate, R-Lipoic Acid, Berberine HCL (Goldenseal Root). Blue Crush: Natural and artificial flavors, citric acid, malic acid, maltodextrin, silica, sucralose, acesulfame k, and FD&C Blue No. 1. Cherry Lime: Natural and artificial flavors, citric acid, malic acid, maltodextrin, silica, sucralose, acesulfame k, and FD&C Red No. 40. Sour Candy: Natural and artificial flavors, citric acid, malic acid, maltodextrin, silica, sucralose, acesulfame k, FD&C Yellow No 5, and FD&C Blue No 1. 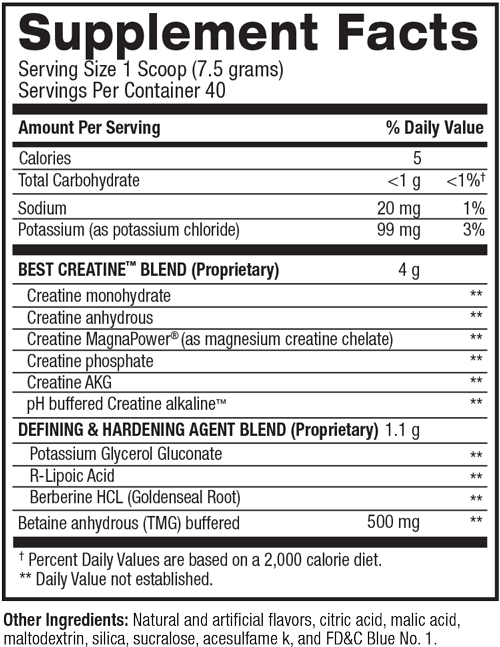 WHAT IS BEST CREATINE DEFINED™? WHAT IS A PARTITIONING AGENT? HOW MANY SCOOPS SHOULD I TAKE? It is recommended to take (1) scoop mixed with 8 oz. cold water before, during, or after a workout or as directed by a qualified healthcare professional. WHAT CAN I STACK BEST CREATINE DEFINED™ WITH? We recommend using Best Creatine Defined™ for 4-8 weeks consecutively with a 4-week break in between cycles. IS IT NECESSARY TO LOAD BEST CREATINE DEFINED™? No, it is not necessary to load with Best Creatine Defined™.